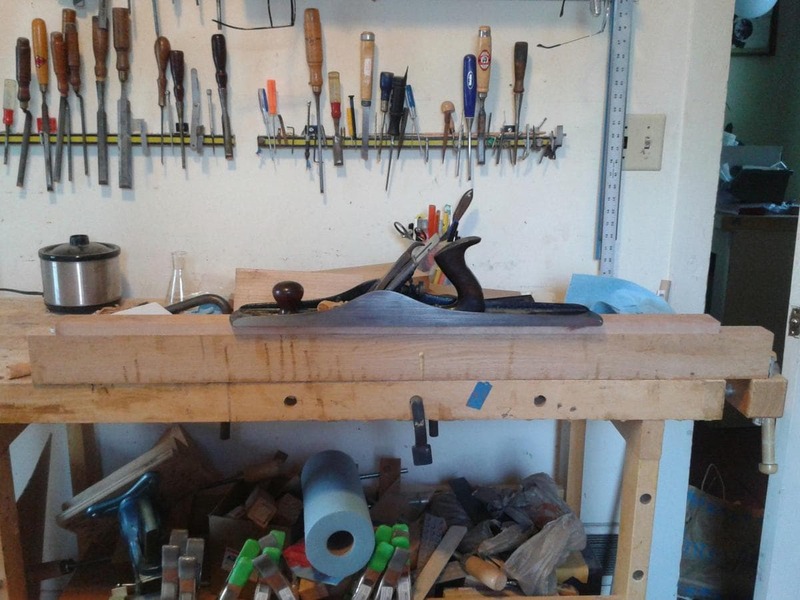 There are a few things going on in this photograph that may be of interest or amusement to dulcimer builders, woodworkers, luthiers, and those who are easily entertained. Before describing what is happening in the photograph I will say that I am shopping for a decent camera. Years ago an excellent digital camera suddenly lost it’s mind and made any photograph it took look like a 1960’s Hippie themed B-movie hallucinogenic scene. I bought another camera and no matter what I do the photographs look grainy. I have recently been using my phone which has a mediocre camera that occasionally screws up and takes a good photograph. Soon I will have a new camera and all the excitement shared here will be crystal clear again. When planing necks and fingerboards flat I need to place them on a flat surface, otherwise the wood takes on the irregularities of the surface on which it is planed. In the past I would plane the top of the bench flat once or twice a year to assure it was an accurate work surface. Over the years my dulcimer making techniques have evolved and a lot of the work that took place on the bench now takes place on flat work-boards mounted in a vise and suspended above the bench. This places the work at a more comfortable working height, assures a flat surface, and makes it easier to clamp parts together. Using work boards eliminated most of the need for a dead-flat bench but I still needed a long, flat surface for working on necks and fingerboards. I solved the problem by truing up a beam of quartersawn oak and using it as a bench-on-a-bench. I drilled a hole for a bench dog on one end. This bench dog also goes through the oak and into a dog hole on the bench. I lock the beam in place using a bench dog in the end vise and plane away. In the photograph a cherry neck is getting planed with a #7 plane. The cherry has been planed a few times before. I plane fingerboards flat and then let them sit for a week or so and then plane them again. After a few more weeks I do the final planing before turning the wood into a neck/fingerboard. The idea behind this is to let the wood move and adjust to stresses released and new surfaces exposed to the environment after planing and then true it again. And again. The end result is a piece of quartersawn, well-seasoned stable wood that will stay flat. Sometimes I end up with a piece of quartersawn, well-seasoned unstable wood that won’t stay flat and those become braces, binding, or firewood. I am not going to comment on your woodworking other than to say this – your workbench seems to be used for woodworking. Many times a workbench just seems to be there. Yours is being used. My workbench at the moment is being cleaned. I am not the only one that uses it and so it sometimes has more things on it than need to be there. That’s a very practical and clever solution to the problem. My approach is a little different. I use the cast iron table of my table saw as a “flat” surface. I know it’s not perfect but it does rather well for those circumstances where I need a large level surface to reference to. For my fingerboards things are rather different. First of all they have a 2 1/2″ radius and second I don’t want them flat. That makes for buzzes in the lower part. I plane them to a gentle parabola. A bowed string moves a lot and having good relief is important. Just my 2p. Someday I hope to have a table saw that is flat enough to use as a reference! I do plane relief into the fingerboard before fretting to avoid buzzes and to make the action comfortable. I imagine on a bowed instrument you need much more relief; they are very different critters!